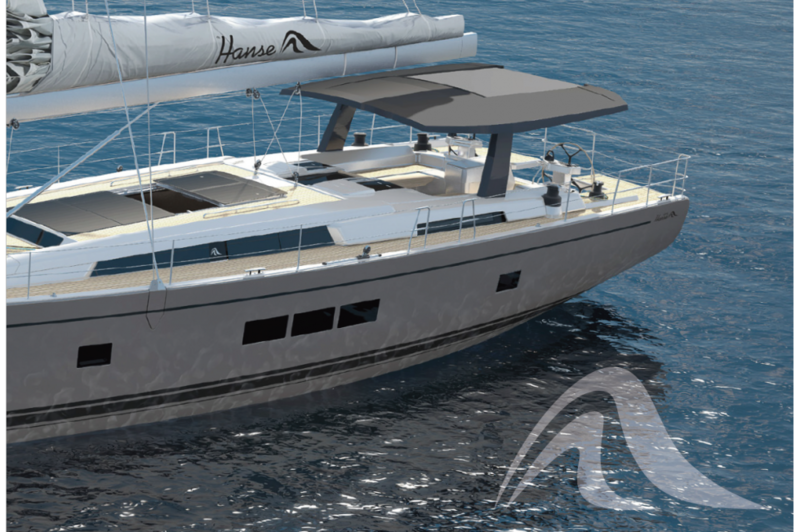 As one of the world´s very few serial producers of 70 feet large sailing yachts, HANSE knows how to achieve velocity in this class – without compromising sailing properties and comfort in any way. 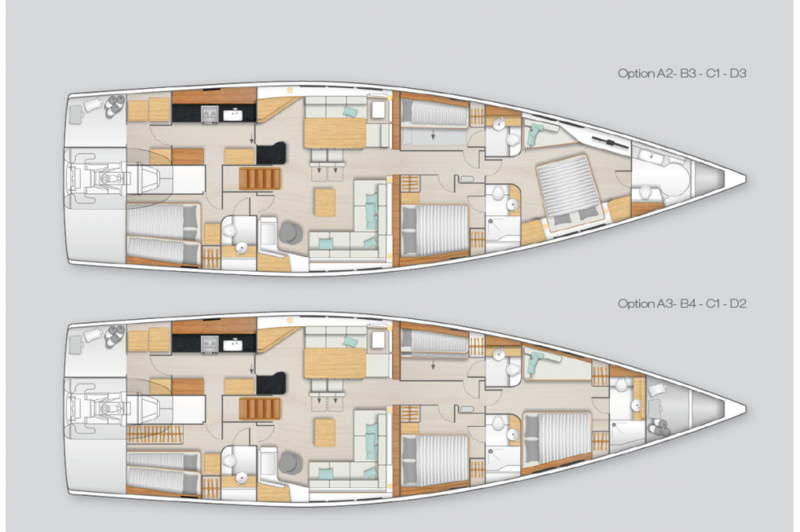 The new flagship of our fleet shows a trendsetting combination of enormous size and amazing performance. Use the opportunity to get onboard the future! 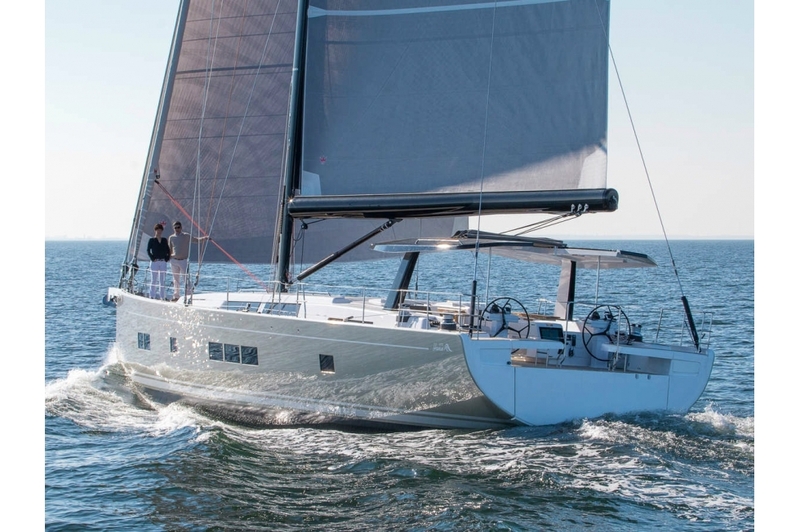 The world-renowned naval architects judel/ vrolijk & co combined their knowledge on racing with the demands of easy sailing in a perfect way. 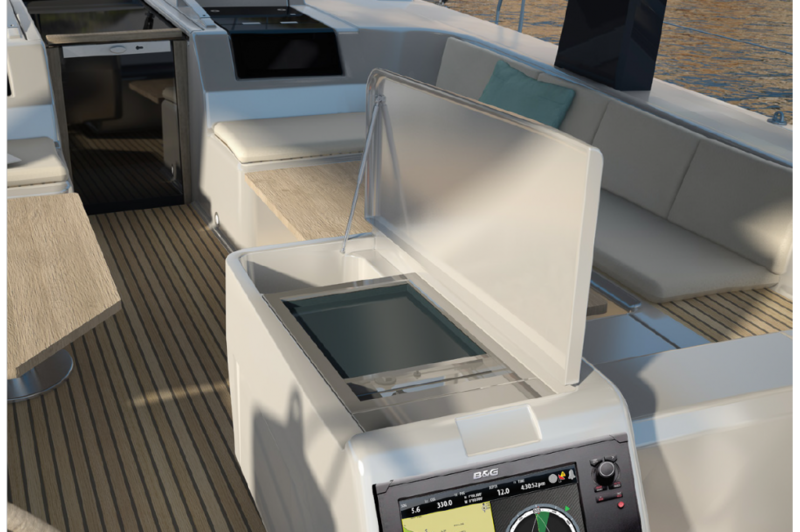 Featuring perfect ergonomic design, the twin wheel stations allow to steer the yacht with little effort. 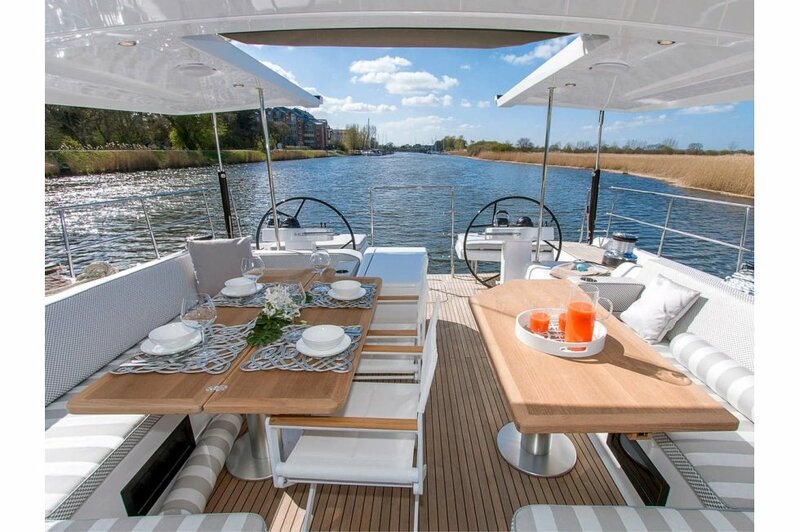 With all the sails operable from the cockpit and the chart plotter right in front, the helsman may be the one on board who enjoys the cruise most. 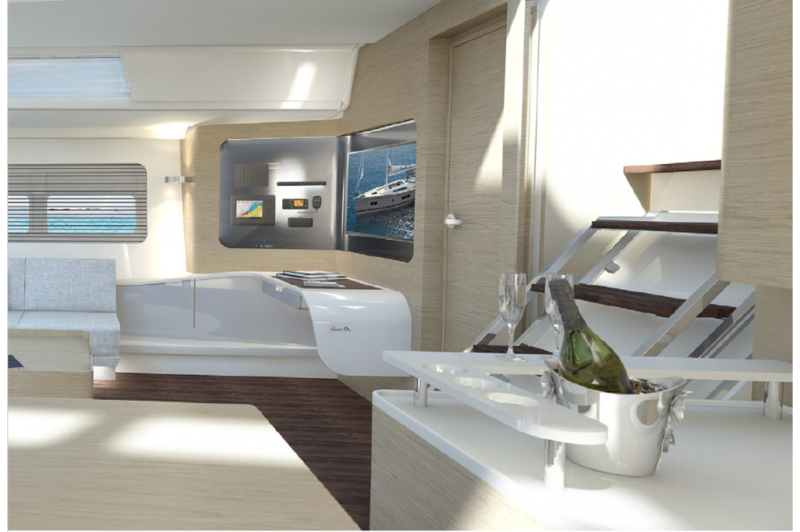 Design, performance and excellence make the 675 a supremely rewarding boat to sail. 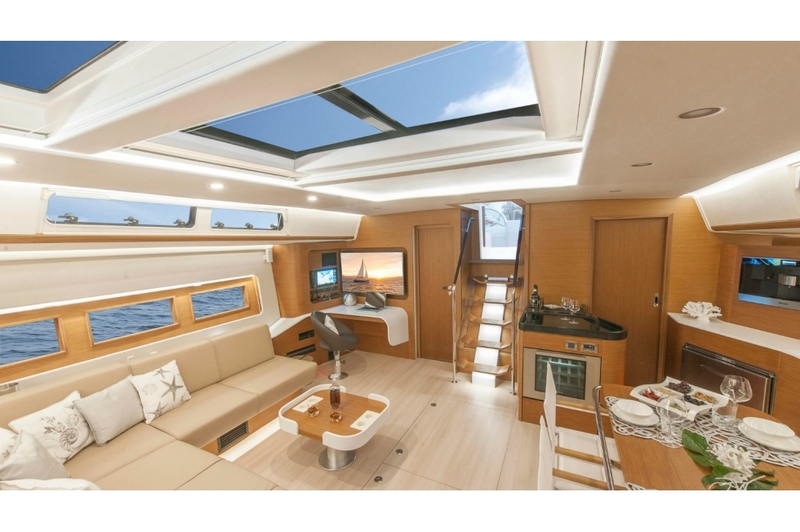 It has all the elements that yachtsmen wish to find on board of their perfect dream boat – and will delight even the most demanding of owners. 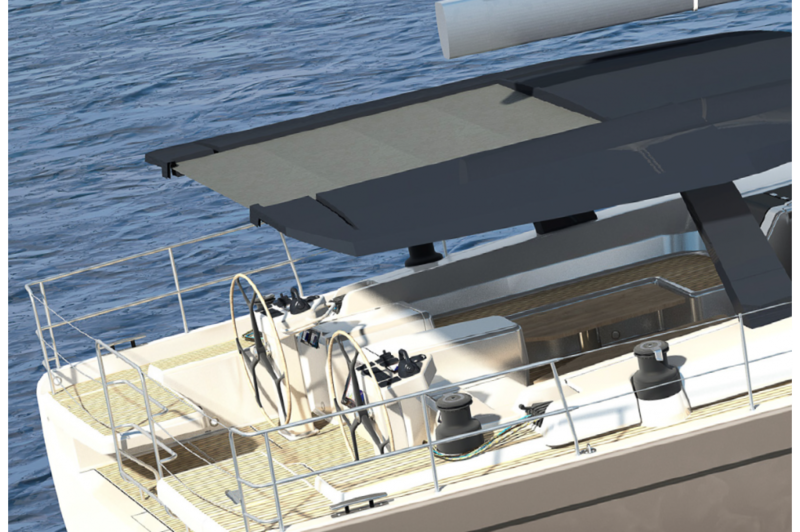 One of the most important goals in boat design is to provide sailors perfectly with light and shade on deck. Unsurprisingly, a large fixed hardtop is the most characteristic design feature of the 675. It continously protects both helmstations from all weather exposures. 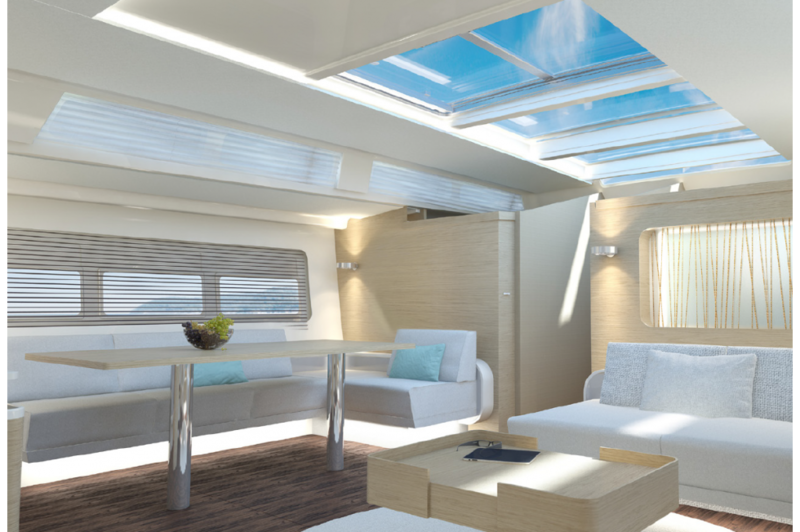 The helmsman is still able to enjoy the sun whenever he likes by opening the built-in sliding bimini. The large saloon roof is made of glass and can be fully opened for ventilation. At the front, its forward facing part is angled down to allow views ahead. Sailing is all about relaxation, so we have kept a spacious area clear for those wanting to soak up the sun. 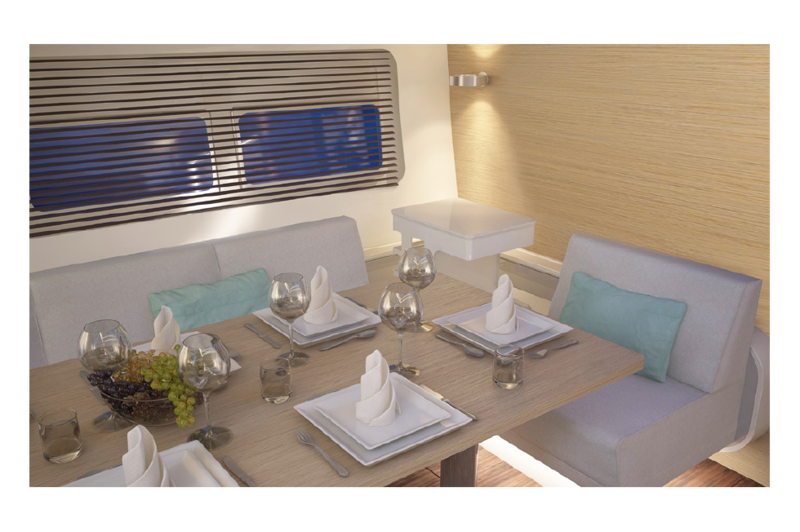 On the foredeck, there is a comfortable living area that works equally mid-ocean as it does at anchor or in the marina. The XXL-Sunpads are large enough to surround yourself with everything you like to have in reach. To make relaxation complete, grill and fridge can be installed in already provided spaces. 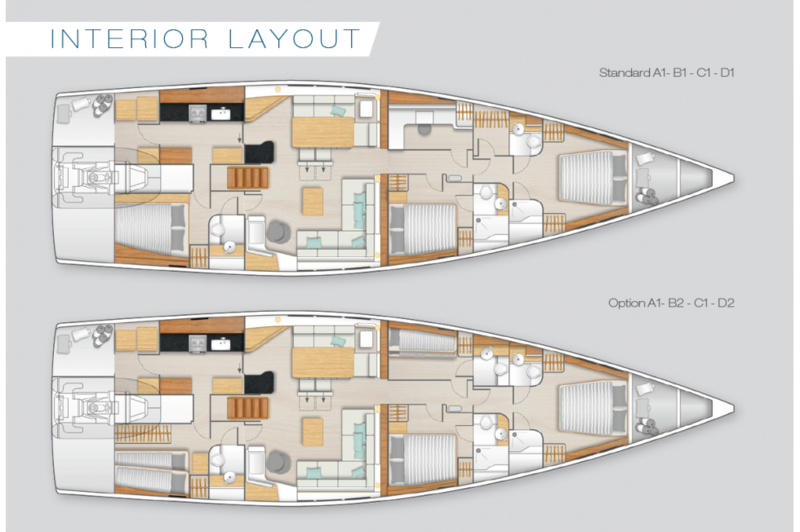 Any room below deck breaks the traditional standards for yachts in this class and sets an exclamation mark behind the word "style“: Let your eyes wander over smooth rounded lines, sophisticated detailing, cutting-edge conveniences and high-class surfaces beautifully reflecting the daylight inside. No question: This airy space is entirely made for everyone´s wellbeing. 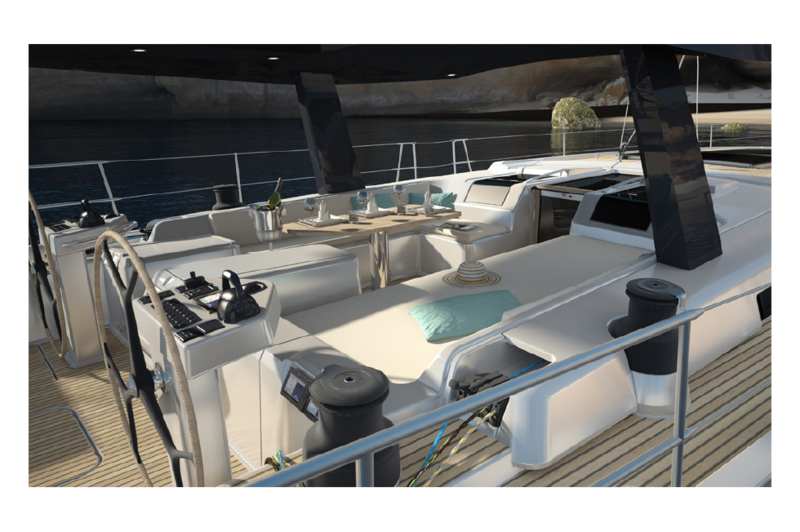 It´s the owner´s privilege to have the entire bow area all to himself. 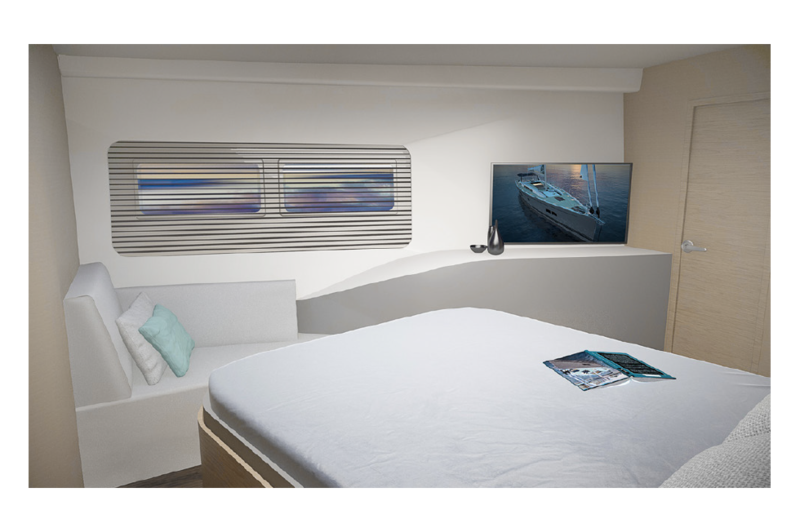 The master cabin invites you to indulge in total privacy any hour of the day. Enjoy being surrounded by a modern and exquisite taste. 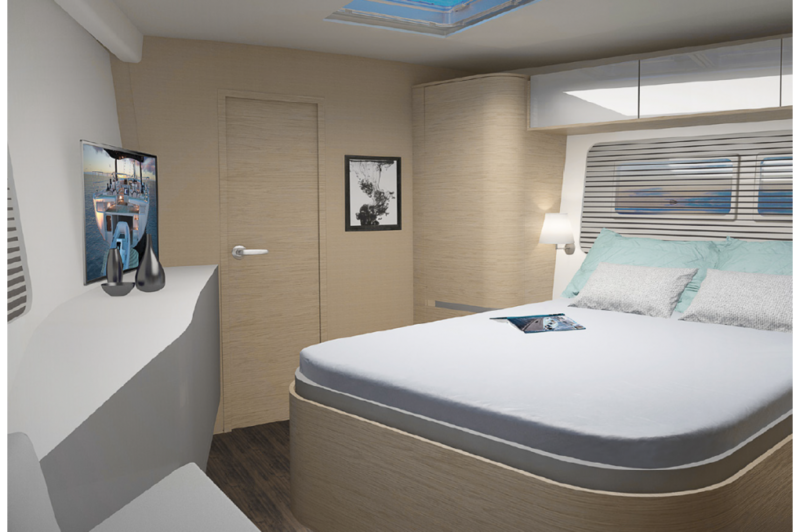 Needless to mention the cabin offers generous en-suite facilities and another television just for the owner. 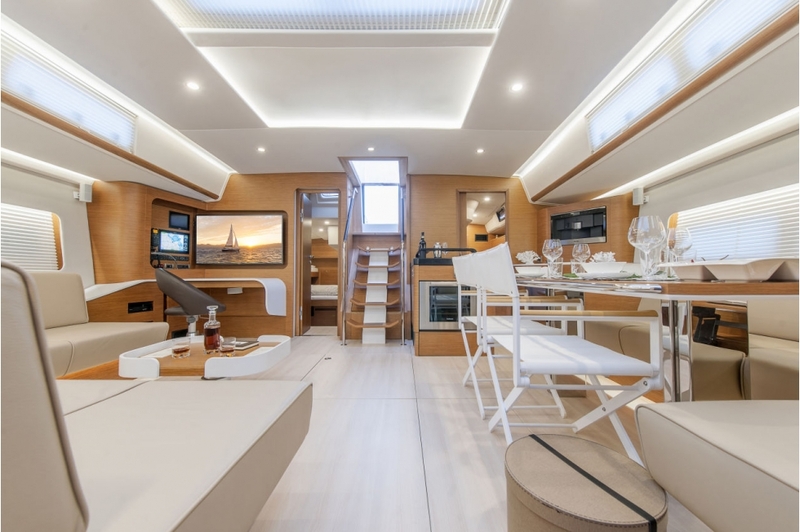 One of the most stylish interior elements is the media corner in the saloon which extraordinarily combines entertainment, board control and navigation. Angled by 90 degrees, it features two parts: Chart plotter, control panel and radio set are attached in the first, the entertainment system can be found in the other one. 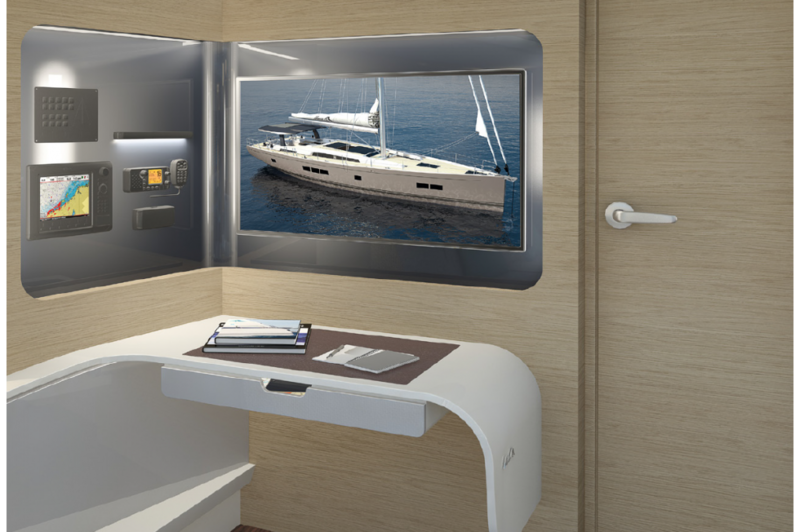 Directly underneath, there is a lit table: While sailing, it can be used as chart table. 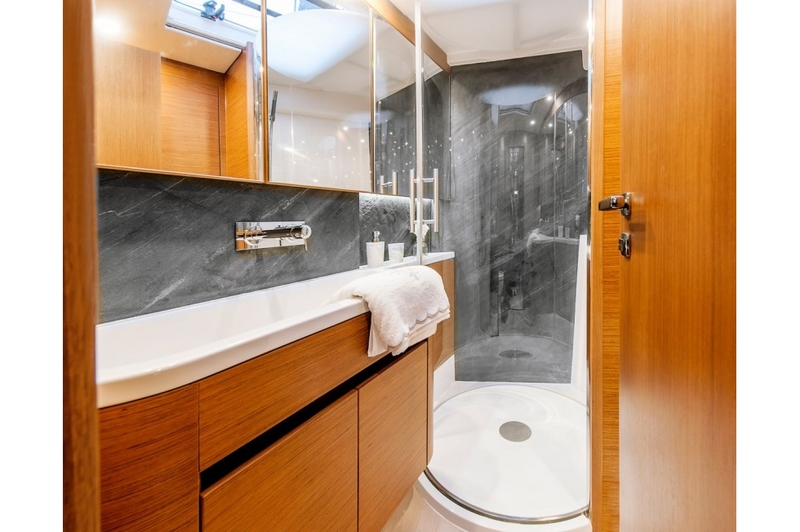 At anchor, it provides another stylish stowage space.